Yay! I can sleep in tomorrow! 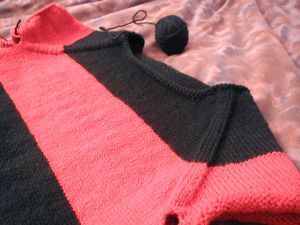 I finally got a neckline I’m satisfied with on the red and black sweater. I dropped the front neck by doing short rows, and it’s pretty snazzy, I think. 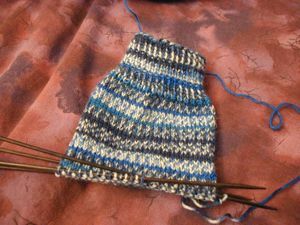 I also cast on for some socks in the Regia Jubilee I got a while back – so good for travelling project. 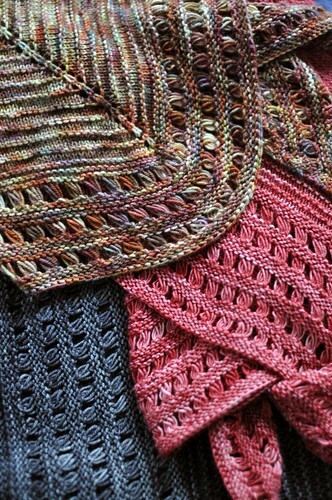 And I’m using the YUMMY Lantern Moon double points I bought. No ladders, yay!